Bird Feeders Made in the USA by Looker Inc. Our clients include over 650 specialty stores nationwide. 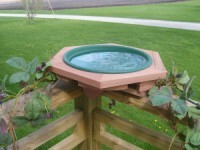 Looker is a leading manufacturer of Deck Mounted Bird Bath. Choose green SE703 or clay SE568 pan.